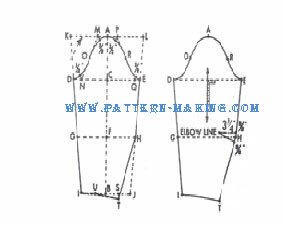 The pattern measurements and drafts shown below, are for the dress bodice and sleeve for junior petite – size 7, and for teen size 12. Junior petite pattern are proportionately designed for the fully developed figure, about 5 ft tall. Teen size patterns are designed for the fairly developed figure, measuring about 5 ft. 3” tall. but make the following changes: Draw line for front side seam, 3/4″ away from back side seam at waistline (point BB), to nothing at armhole (M) as indicated. 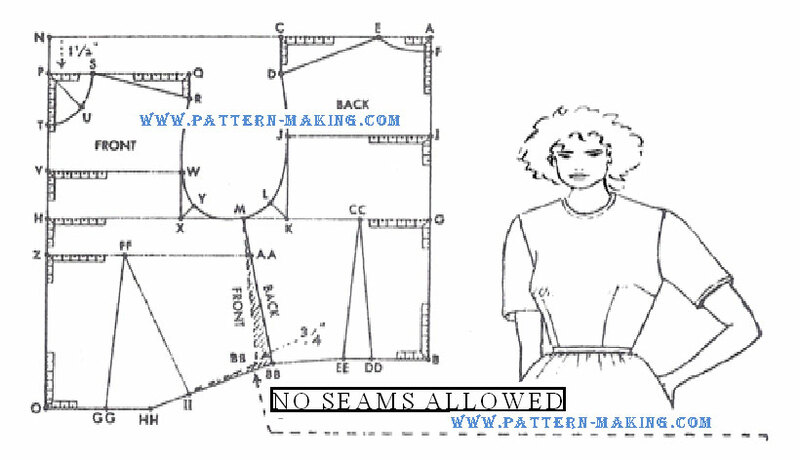 4 AND 5 – Instead of 1/4″ ease at shoulder seam, make 1/2″ wide dart, 3” long at center of shoulder seam; then add 1/4″ to shoulder at armhole as shown by dotted lines. Make the waist dart, 1” shorter at tap. Length of elbow dart, 3-1/4”. The measurements include the necessary ease allowance around arm (at muscle), elbow and wrist.